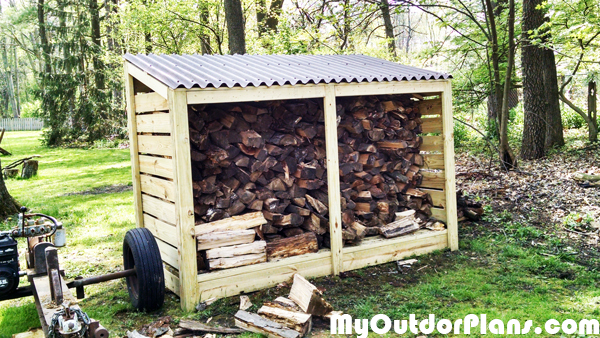 I used a Framing Nailer instead of screws and it made this firewood storage shed a very easy project. I used all pressure treated lumber, except for the rafters. I had to add 3 Purlins (10′ 1″ x4″, cut to 99.5″) across the top to accommodate nailing the Ondura corrugated asphalt roofing. All total approx $300 and less than 8 hours. Does not include nails as we already had boxes for our Framing Nailer. I have very minimal experience but have a step-father who has all the tools. If I had to build this again, I would make the high side the open side. Easier access and you could get away with 1 less 1*6 back wall piece. Again, my sons and I had great fun building this and are looking through all the plans for our next project(s). Thank you for sharing the project and for the notes after using the project. Can’t wait to see what you will build next!